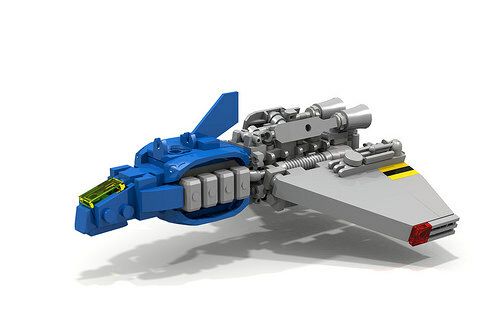 This micro-scale Classic Space ship hits all the right notes in both shape and detail. The builder, Rancorbait, makes excellent use of a few parts. The one that really drew my eye was the repeated box shape near the front. Then I realized it was Thor’s hammer. It looks fantastic, and totally makes me feel justified in requesting this part in a LUGBulk order. They don’t call it *Classic* Space for no reason! Timeless color scheme, magnificent part usage.